Do you want to get every individual & team in your organization to be fully energized and performing at their highest level? Do you want to increase sales, customer satisfaction and business development efforts? Do you want to maximize employee engagement, retention, problem-solving and innovation? If yes, then read on. I’m going to give you a free game, Cards Against Mundanity (small group question-and-answer game that sky rockets trust in 45 minutes or less). It gets people to learn and understand each other in a deep, and meaningful way (and you can read about the experiences of people who played it here). It works in any industry and any organization size. Teams and individuals can use it as well (both internally and externally with clients, prospects, etc.). On average teams are increasing trust, engagement, and team closeness by more than 20%+. That translates into double-digit increases in performance and key metrics. Typically, that same increase would take five-plus years and 6/7/8-figure spend. 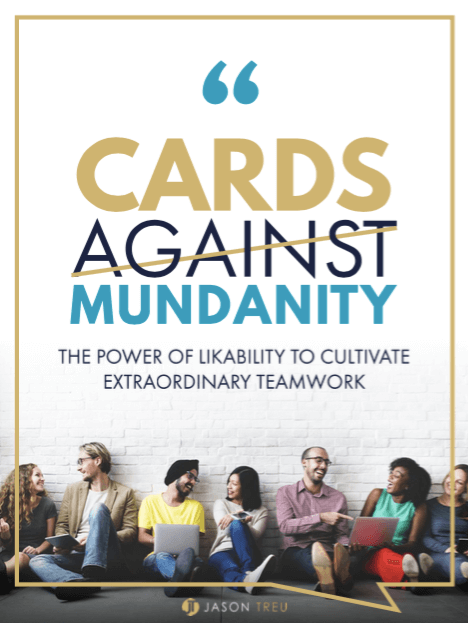 More than 12,000+ people have played Cards Against Mundanity including organizations such as Amazon, Google, Microsoft, Ernst & Young, Oklahoma City Thunder (NBA Team), Merck, Novartis, Intel, Houghton Mifflin Harcourt, Southwest Airlines, PRSA, Blue Cross Blue Shield, Thermo Fisher Scientific, Worldwide Express, Phillips May, Houston-Galveston Area Council, and many others. Several schools have used it, sports teams, charity organizations, government organizations, private equity firms, venture capitalists and others. Any organization will benefit from playing it. Which one was it? What did you accomplish together? How did it feel to be connected to something bigger, to sort of lose yourself in that moment? Unfortunately, many leaders believe that building high performing and innovative teams are like your DNA – you either have it or not. THAT’S NOT TRUE AT ALL. It’s not luck or an accident. It’s learned behaviors backed by science and intentionally developed and prioritized by leaders. Business leaders and managers can learn how to “dial in” to the right behaviors and environment to put every person in a peak state of performance and innovation. Why does this ultimately matter? Collaboration is taking over the workplace. With employees spending more than half their time working together, teamwork is critical to organizational success and market leadership. However, according to Gallup, almost 70% of employees are disengaged and it’s costing U.S. businesses $550 billion every year. The secret to building the highest performing and most innovative teams is prioritizing and building a team and organizational foundation based on psychological safety, vulnerability, truth-telling and operationalized values. Harvard found over a 11-year study of 200 organizations that ones with a strong culture increased net income by 756% versus ones without it only increased by 1%. Employee retention rates went up 200% when companies spent one hour during the on-boarding process having new employees get to know one another. Are you an Executive, HR, Sales or any manager looking for a way to significantly improve performance, teamwork, problem-solving, and engagement? Are you planning a corporate retreat, meeting or team offsite and need a way to bring your team closer together than ever before? Are you an individual contributor looking to rocket your career trajectory upwards? Are you trying to close prospects and sell more to existing prospects? Are you part of a merger or acquisition? Are you a private equity or VC trying to maximize performance in your portfolio of companies? Are you a non-profit trying to increase contributions and get more volunteer support? Are you a coach of a sports team trying to maximize performance and teamwork? If you answered yes to any of the above, Cards Against Mundanity will work for you. Chances are you have tried team building exercises, workshops, leadership/management training and activities that either didn’t work well or that employees didn’t enjoy. Or perhaps you are looking for something engaging, new and fun that actually works! You’ll see results in minutes when you play it. Cards Against Mundanity is the solution for you (and it’s FREE with instructions and FAQ!). It’s a question-and-answer game played in a group, like Cards Against Humanity, that works for any size organization and/or team. You can also play it across multiple teams in the same organization and get the same benefits. You can also use it with any external audiences: prospects, clients, partners, media, analysts, etc. There is an FAQ below that will answer most of your questions, as well as a button to download the game [it’s free]. Foster closeness and break down emotional and social barriers in less than one hour that improves team performance, communication, collaboration, and retention. For 99% of teams, this would take years or decades, if ever. Create “psychological safety,” which is the #1 factor in building the highest performing teams. For example at Google, among sales teams, those with high psychological safety exceeded their targets by, on average, 17%. In contrast, those with low psychological safety missed their targets by, on average, 19%. Build trust, respect and where people are comfortable being themselves, which significantly improves problem-solving, innovation and creativity. Build high levels of trust and rapport with key third-parties such as clients, prospects, partners, etc. “Thank you for speaking at our SHRM seminar in Texarkana on Tuesday. You presented such valuable information that will be useful in my position at work as well as my dealings with people in other areas of my life. WHAT IS CARDS AGAINST MUNDANITY? 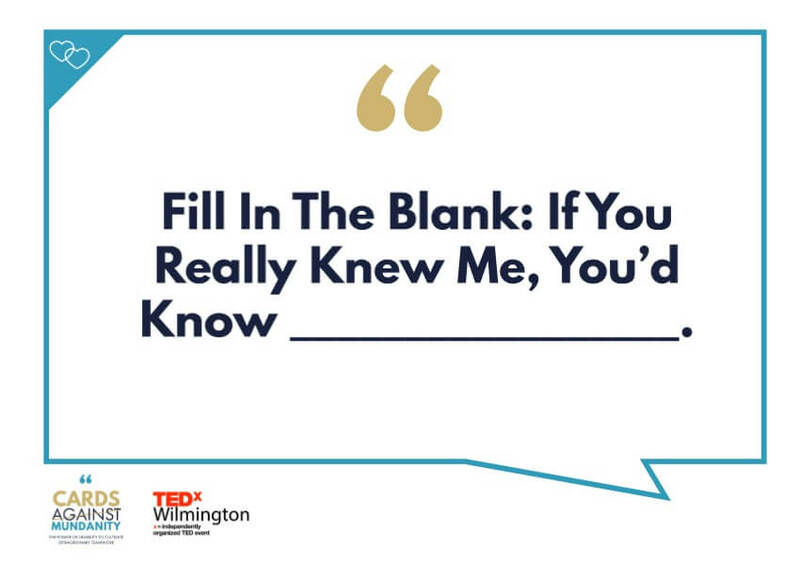 It’s a small group question-and-answer game that increases trust, team closeness, and engagement by more than 20%+ in 45 minutes or less. That corresponds to double-digit increases in performance and key metrics. The game is simple … question and answer. Take the top card, read it, answer it, and the next person goes. Each person answers at least three questions. At the end, each person has one minute to share one thing they learned about three different people. Download the game, including all the instructions, and get additional suggestions on how to continue building a high performing culture like Google and many other companies in the Forbes Best Places to Work list. 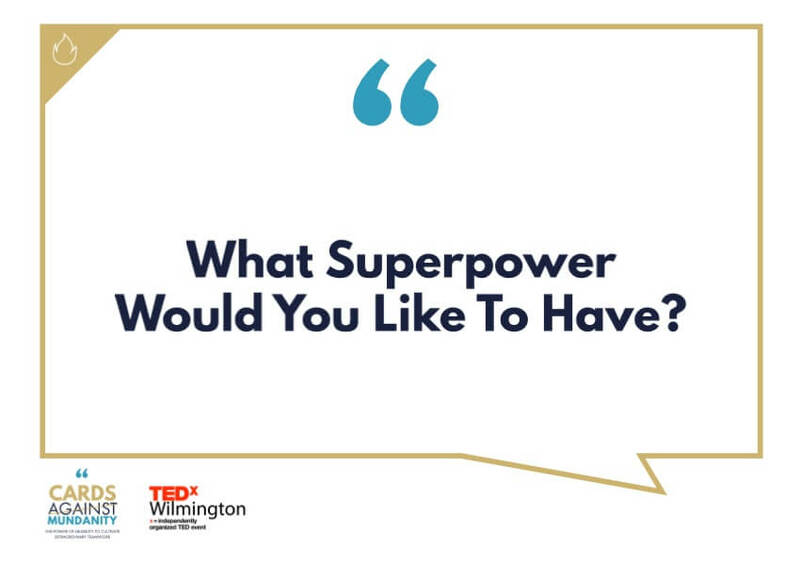 I debuted the game in my TEDxWilmington talk, “How to Get CoWorkers to Like Each Other.” I shared research, data and suggestions on how to maximize employee engagement to increase performance, productivity and long-term organizational success. In the video, you’ll learn why teams thrive and falter, and how you can quickly implement strategies that will make an immediate positive impact on your team. 70% of people said the #1 factor for a happy work environment is working with people they like and having friends. Employees with a close work friend are 7x more productive and more loyal. 42% of people have no friends at work. LONELINESS is as dangerous as smoking 15 cigarettes a day. 70-80% of workers globally are not actively engaged in the workplace, and it costs US businesses $550 billion dollars annually in lost productivity. Organizations with engaged employees experienced a 19 percent increase in operating income over a 12-month period, compared to a 33 percent decrease in companies with disengaged employees.That’s a 51 percent difference in profitability between companies with engaged staff compared to those with disengaged staff. Highly engaged employees are 87 percent less likely to leave your company than disengaged employees. Replacing employees can cost your company anywhere from 16 percent up to 213 percent of salary depending upon the role. WANT ME TO CONDUCT THIS AS A WORKSHOP FOR YOUR TEAM? Check out various options you can do the workshop for your team, organization, off-site, meeting, customer events, and much more. Click here. What benefits will you get by implementing these materials? What if I manage a team, but my organization isn’t on board yet and/or doesn’t buy into this way of thinking? It will work. It doesn’t matter if others buy into it or not. The ONLY thing you will have to do is reinforce the concepts here on a more regular basis than an organizational-wide implementation. I’d recommend doing things every 60 days or less. They can be exercises that are 10-15 minutes in duration. What if I’m an individual contributor? It will help you. You can pitch to your manager to use. You can use it 1:1 with colleagues, your manager, any external parties you interact with, etc. How would I use this with external partners/audiences? I’ll use a sales example. For a prospect, you’d play a couple questions at the end. You could say something like, “I really get to know the people I work with. I have a fun game that’s similar to Cards Against Humanity, but for the workplace. Want to try a few questions?” You can do the same thing with current clients, either in a group or 1:1. You’ll see results after only 5-10 minutes. And they typically don’t want to stop playing either. What if people don’t want to share and open up? 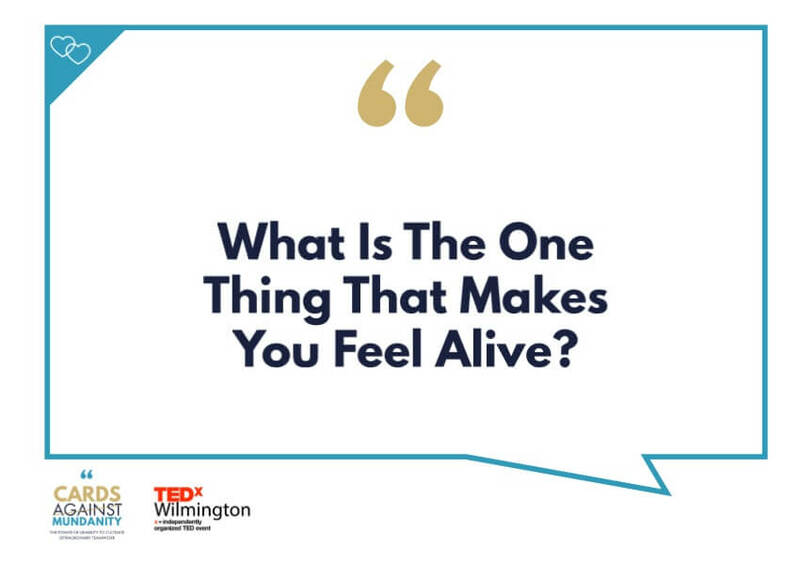 I put in questions called “Conversation Starters.” They are fun, light and easy questions. People rarely use them. As long as the leader (or first person playing) picks the “Connection Question” everyone continues to play with them. You’ll start to see results immediately. I’d give it 90-120 days to start seeing the full effects. It’s also dependent on “you” the manager/leader to create the conditions for people to thrive, and incorporate the values I share in the video/PPT. In today’s litigious environment, do you see problems or push back with individuals when they play Cards Against Mundanity? Do you see people using the information people share against each other? I’m not a lawyer, and I’m not offering any legal advice. Please seek out in-house counsel and/or attorney for legal advice or any questions you may have. In my experiences, I’ve never had anyone push back or use the information against someone else. How can I bring up playing this game to someone I work with? They will say yes. Everyone likes to play games. Plus, you also have research and ROI data you can share. As the team leader, how can I roll this out to my group? I think sharing why you believe this important is a critical step. They will be able to use the information strategically in their interactions. I think a five minute explanation is plenty. You have all the materials, research and videos as well. You can also share Google’s research on Project Aristotle. You can email me for help and/or have me conduct the workshop for you. How do we play? How should I divide up my team/organization? There are instructions in the game. Optimally, it is 6-8 per group. For example, if I had 24 people, I’d divide the groups up in 6s. If it were 8 total, I’d do one group. You’ll have one person keep track of the time. Each person gets a maximum of two minutes to answer a question. You play a minimum of three rounds (five is optimal). The most senior person goes first and starts with a connection question. You can make a group announcement stating this during the activity or tell people ahead of time. At the end, each person has one minute to share three things they learned during the game. I’d recommend bringing people back together and asking them to share what they learned. For example, “Who is willing to share their experiences playing the game today?” “What did you take away from playing the game?” “How can you use this in your job?” etc. You also can do an activity afterward such as brainstorming, working on a difficult challenge, getting feedback, etc. People are in a peak state of engagement, creativity and problem-solving. They will be willing to share more than they normally do. Another best practice is if it’s a company-wide rollout, I’d have the management team play first so they can experience it and answer any questions people may have. What if my team and/organization is very large 50-1000s? The results accrue across the entire group playing. They don’t have to be in the same team. I’ve done it with 500 people and worked the same as if there were six people. Can I use this for a team-offsite, company meeting, conference, ice-breaker, etc.? Yes! You don’t need to give people information on the game. You can just play it. The results will be fantastic. How do I follow this up? Here are other activities you can do over the next 12-15 months. I’d recommend doing something every three months. It can be an activity that takes 5-10 minutes. You must prioritize and institutionalize the core principles I share in your team and/or organization. If you are an individual contributor, you can come up with ways to get people to share. You’ll be able to customize the information here to do that.